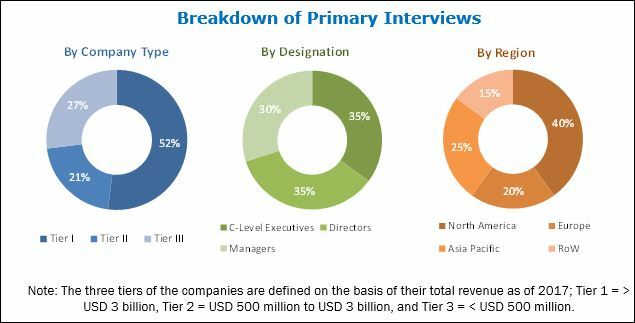 [143 Pages Report] The wired interface market was valued at 6.30 billion units in 2017 and is expected to reach 8.78 billion units by 2023, at a CAGR of 6.2% during the forecast period. The said market was valued at USD 15.31 billion in 2017, and is expected to reach USD 34.72 billion by 2023, at a CAGR of 14.2% between 2018 and 2023. The base year considered for the study is 2017, and the forecast period is between 2018 and 2023. The objective of the report is to provide a detailed analysis of the market based on component type, device, and geography. 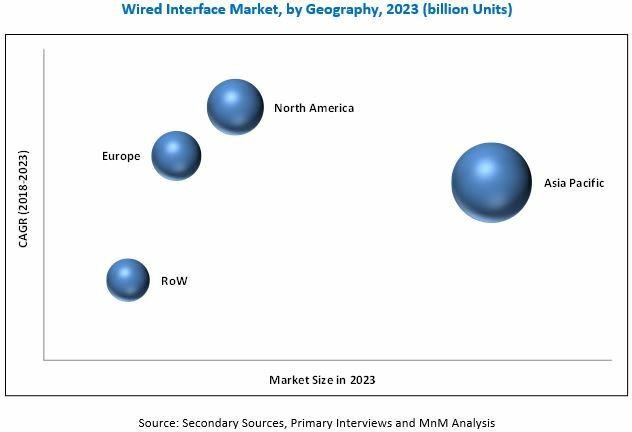 The report also provides information regarding the major factors (drivers, restraints, opportunities, and challenges) influencing the growth of the wired interface market. In addition, key players in the market have been strategically profiled, and their market ranks and core competencies have been comprehensively analyzed. In addition, the competitive landscape for market players has been studied in detail, along with their growth strategies, such as product launches, product developments, acquisitions, partnerships, expansions, geographical expansion, contracts, and collaborations. This research study involves the extensive use of secondary sources, directories, and databases (such as annual reports, press releases, journals, company websites, and paid databases) to identify and collect information (OICA, CIPA, and GSA) useful for this study. The entire procedure includes the study of the financial reports of top market players. After arriving at the overall market size, the total market has been split into several segments and subsegments, which have been confirmed with key industry experts, such as CEOs, VPs, directors, and marketing executives. 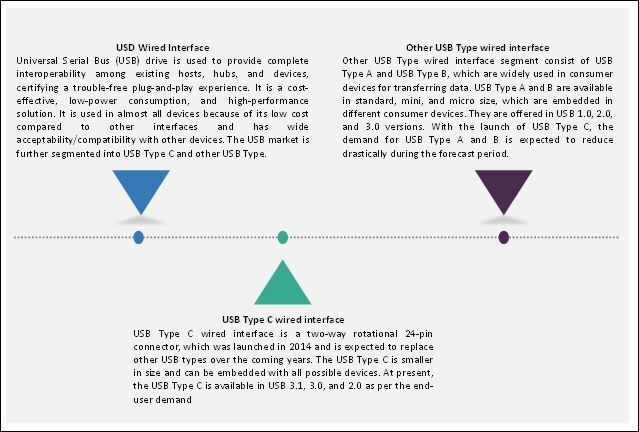 The report also provides size of the market for wired interface for all device and component types. The following figure shows the breakdown of primaries based on company type, designation, and region. Companies such as Molex, Inc. (The US), Amphenol Corporation (The US), Japan Aviation Electronics Industry, Ltd. (Japan), TE Connectivity Ltd. (Switzerland), STMicroelectronics N.V. (Switzerland), NXP Semiconductors N.V. (The Netherlands), Microchip Technology Inc. (The US), Texas Instruments Inc. (The US), Cypress Semiconductor Corp. (The US), Rohm Co., Ltd. (Japan), Hirose Electric Co., Ltd. (Japan), ON Semiconductor Corporation (The US), Analog Devices Inc. (The US), Diodes Inc. (The US), Murata Manufacturing Co. Ltd. (Japan), Vishay Intertechnology, Inc. (The US), Silicon Laboratories Inc. (The US), Maxim Integrated Products, Inc. (The US), CUI, Inc. (The US), and Yamaichi Electronics Co.,Ltd. (Japan) are some of the major players in the wired interface market. What are new application areas which the wired interface companies are exploring? Which devices/industries are lucrative investment pockets of the wired interface market?